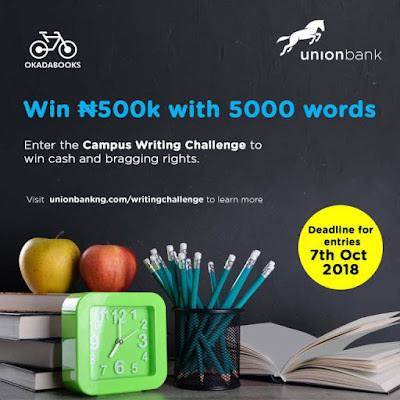 OkadaBooks, one of Nigeria’s top e-publishing platform, has announced the call for entries to the maiden edition of the Campus Writing Challenge, sponsored by Union Bank, one of Nigeria’s long standing and most respected financial institutions. The Campus Writing Challenge, which focuses on discovering students with raw, bold and creative writing talents, is open to students of tertiary institutions across Nigeria. The Writing Challenge which is Okadabooks initiative aims at providing the students with the exposure needed for them to hone their crafts and become master storytellers. During the entry period (Monday, August 27 to Sunday, October 7, 2018), students are invited to submit short stories between 3,000 and 5,000 words. The winning entrant is entitled to a cash prize of N500,000 while the second and third best entrants will receive N200,000 and N100,000 respectively. There will also be a mini award category, including a N50,000 prize for the best short story cover as well as an ‘audience favourite’ award and several other consolation prizes. As you already know we at ACEworld are dedicated at what we do. & what is that? Keeping you updated and informed about latest opportunities around the world. Why don't you just subscribe to our newsletter at the sidebar and save yourself some stress?